Bird banders catch and release huge numbers of migratory birds each year in a hope that someday one of them will be recovered and add to our knowledge of science. Little metal rings with tracking numbers on them are added to the birds legs before they are released and if someone recaptures the bird or finds it dead the number on the leg will tell researchers where and when it was originally captured. On average, about 1.1 million bird bands are placed onto the legs of birds. Only about 65,000 are recovered which is about six percent. Keep in mind though that this includes all of the banded game birds which have a much higher recovery rate. About 600,000 non-game birds are banded each year and only one percent of those bands are ever recovered. We recently received word that one of our bird bands from work was sent into the banding office in Washington DC. The band had been placed on a White-throated Sparrow on September 25th, 2009. White-throated sparrows actually nest north of our location so we were catching this bird on the way back down south. 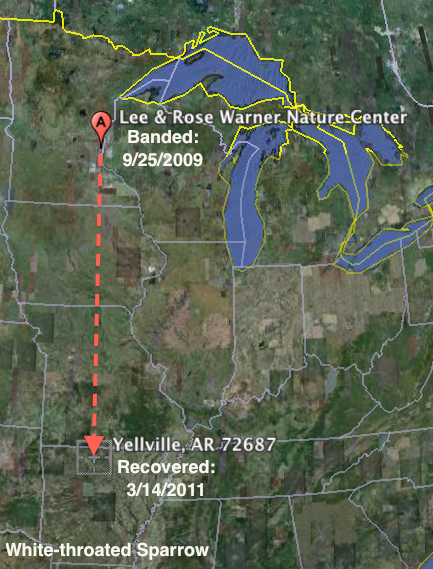 The data we received back tells us that the bird band was recovered on March 14th, 2011 in Yellville, Arkansas. My co-worker Paul who runs our banding program was immediately struck by the same thing I was. This bird was recovered almost exactly due south from the nature center. It is generally in the area we'd call the Mississippi Flyway but it is pretty far from the river. I find it fascinating that it would stay at essentially the same longitude. Coincidence? We'd need a lot more recovered white-throated sparrows to answer that question. The bird in question was recovered dead. There was no information as to how it died. What long term studies such as banding have taught us is that a two year lifespan is not unusual for a small bird like this. They can live longer but most of them don't. If you happen to find a dead bird look carefully for a leg band. If you find one you can help contribute to science and our understanding of birds.